Kidlet has a fairly simply bento today. I wanted to showcase the amazingness of my very first loaf of homemade bread. 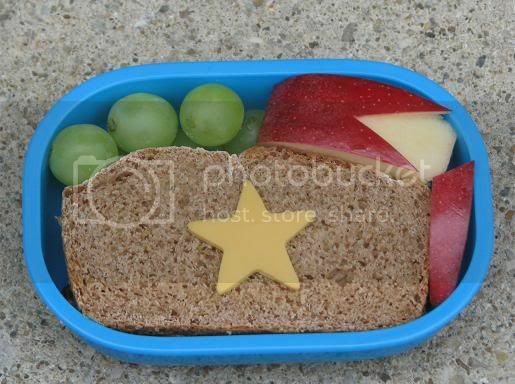 So he gets a peanut butter sandwich with star cheese, grapes, apple bunny, and apple slice. I think I will do a decorative apple slice tutorial some time next week. And here it is in all it's delicious glory. 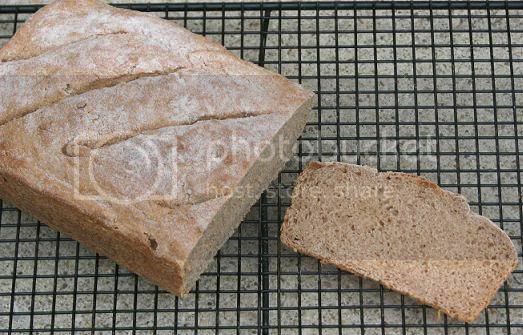 This is the 100% Whole Wheat sandwich bread from Artisan Bread in 5 Minutes a Day. Now, this took me all day to make so the name of the book is misleading. They count the 5 minutes as "active" prep. Well, granted it was very fast dough to whip up and so simple. But with the resting and rising and such it does take up a day. The only reason it suprised me is that I have been hearing about this book from other bloggers for so long that I had this picture in my head of them whipping up bread and having it piping hot and on the table in just 5 minutes. Silly, I know but the reality shocked me nonetheless. I have waited for this book for a long time because my library had a hefty waiting list and I prefer to check out a book before buying it. This is definately on my buy list now! There are a lot of recipes I will enjoy trying out. Oh yes..the resting time is lengthy. But the bread is delicious. Try the oat bread..yum..and all of the "whole grain" breads are great! I've heard a lot of good things about that book...I'll have to make a trip to the library for it.